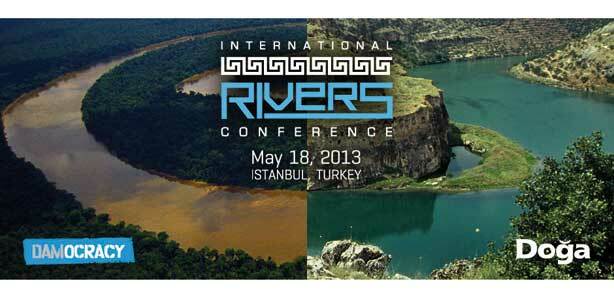 Dam-affected communities and international conservation organizations from South America, the Middle East, Europe, the US, and Africa come together today at theInternational Rivers Conference in Istanbul, Turkey, to debunk the myth of mega-dams as ‘clean’ energy. Over 50,000 dams have been built on more than half of the world’s major rivers in the last century, causing irreversible damage to nature and cultural heritage, as well as the displacement of millions of people. European companies unable to develop mega-dams in their region due to stricter environmental and human rights standards, instead promote large-scale dam projects as a ‘clean’ energy solution to climate change in developing countries. Conference presentations by the international delegation demonstrate the contribution of mega-dams to climate change, the undemocratic processes excluding local and indigenous communities from decisions, and the irreversible damage to the world’s most important cultural and natural hot spots, such as Amazonia and Mesopotamia. A keynote speaker is one of Brazil’s most important indigenous leaders in the struggle against the Belo Monte dam in the Amazon, Kayapo Chief Megaron Txucarramae, who travelled to Turkey with his daughter Mayalú Kokometi Waurá Txucarramãe to show solidarity with those struggling against the Ilisu dam in southeast Turkey. “In the name of economic progress, the dam industry and the Brazilian government want to put an end to our centuries-old way of life. This is being forced upon us, by a government that claims to be democratic. We are fighting to protect our way of life and our environment, and we will continue to do so. We are here in solidarity with those struggling against the Ilisu dam, where tens of thousands of people are also being forced to leave their homes,” said Kayapo Chief Megaron Txucarramae. Belo Monte’s two reservoirs and canals will flood a total area of 668 square km in the Amazon Basin. Scientists fear that hundreds of dams including the Belo Monte project planned in the Amazon Basin may cause the extinction of 1,000 fish species, which amount to one third of all fish species in the Amazon. The Belo Monte dam would displace over 40,000 people including indigenous communities. The Ilisu dam would inflict a similar set of problems, inundating an area that meets nine out of 10 UNESCO World Heritage Sites’ criteria and displacing over 35,000 people, explains Dicle Tuba Kilic, River Program Coordinator for Doga (Nature Association). Work on the dam in Turkey continues in defiance of court rulings, and the withdrawal of funding from European Credit Agencies in 2009 when the Turkish government failed to meet almost all the criteria to protect the environment, cultural heritage and local communities. The Ilisu dam would destroy the 12,000 year-old ancient town of Hasankeyf and affect five key biodiversity areas in Turkey. Its impact would be felt as far as the marshes of Basra in Iraq. Dr. Azzam Alwash, winner of the prestigious 2013 Goldman Environmental Prize for his work on the regeneration of the Marshes of Basra in Iraq, is among the conference’s keynote speakers. Since the fall of Saddam Hussein who drained the marshes in the 1990s to punish the Marsh Arabs’ alliance with the US in the First Gulf War, Dr Alwash has led a concerted effort to restore the largest wetlands in the Middle East. The marshes now face a new threat: the Ilisu dam on the Tigris River would stem water flow to the marshes in Iraq. “We should use our water resources in the Middle East to strengthen regional relations and friendship. Water can easily be an instrument for peace. We have to respect the traditional way of life of the communities who rely on the Tigris River, as well as the wildlife that is an integral part of the ecosystem,” said Dr Azzam. Already strained by water scarcity and political tensions, the arid Middle East region along the Tigris and Euphrates rivers is losing water reserves at a rapid pace. A recent NASA study identified the Tigris and Euphrates River Basin as having the second fastest rate of groundwater storage loss in the world. Turkey controls the Tigris and Euphrates headwaters, which dictates how much water flows downstream into Syria and Iraq. The international delegation will travel to the southeast of Turkey to show solidarity with communities resisting the Ilisu dam. They will meet with Diyarbakir Mayor Osman Baydemir and Hasankeyf residents. Two screenings of the recently launched documentary Damocracy will be held: in Diyarbakir on Monday at 9pm (Aysenur Zarakolu Park) and in Hasankeyf on Tuesday at 8pm (Taziye Evi). The documentary focuses on debunking the myth of dams as ‘clean’ energy and records the cultural and natural heritage the world stands to lose as the foundations of the Belo Monte dam in the Amazon, and the Ilisu dam in southeast Turkey are being laid despite widespread opposition and resistance. It takes the name of the Damocracy movement formed following the Rio+20 Earth Summit last year when governments failed to recognize the permanent destruction of cultural and natural heritage being caused by large-scale dams. DAMOCRACY includes 15 national and international organisations. Among them are Doga Dernegi, Amazon Watch,International Rivers, RiverWatch, Gota D’água (Drop of Water), Instituto Socioambiental and Movimento Xingu Vivo para Sempre. Doğa is 15 years old!